← Ain’t no party like a Parma Party … and you’re invited! Parma #4: Grand Central Hotel … We have a new clubhouse leader! The Verdict: As the title to this post would suggest the chicken parmigiana at the Grand Central Hotel is the best that I have had so far. It was not a parma though that was not without disappointments though; indeed, yet again I received a parma that was “ham challenged”. Chicken Breast: The chicken breast in this parma was excellent. Well crumbed with more than enough meat, it was also cooked to perfection. Tomato Sauce: I love tomato sauce (yet bizarrely abhor tomatoes), so much so that often on pizza I will order double tomato sauce. The tomato sauce on this parma was right out of the top drawer and was generously applied to the chicken breast. With both the quantum and quality aspects ticked I can not fault this sauce. 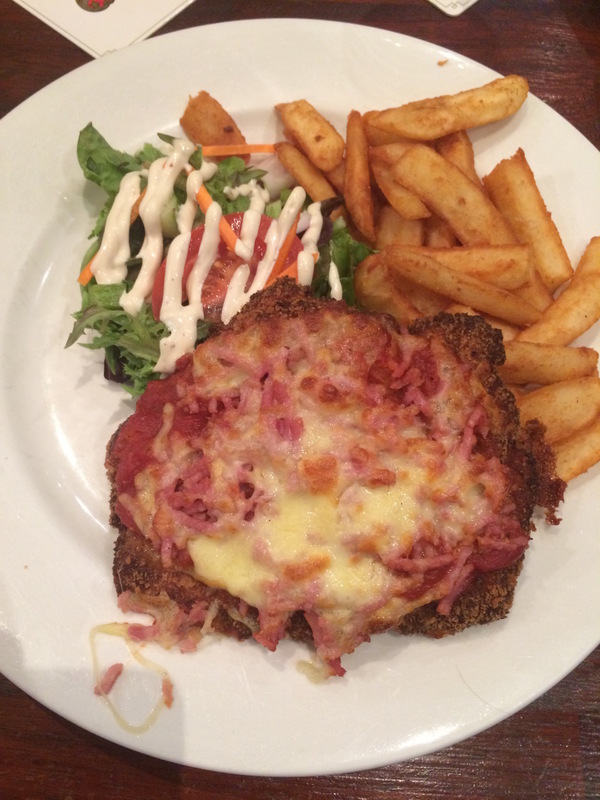 Ham: Why is it that cooks in pubs seem to be so keen to muck around with the ham on a chicken parma? This parma would have ended up much higher on the ladder IF the ham had not been what could be most positively described as “shredded”. Fair dinkum: how hard can it be to place a slice of ham on top of the chicken breast without slicing it? This was the main negative to this week’s parma. Cheese: The cheese on the GCH parma complimented the other parts of the parma well save that the covering of the parma was, again, patchy at best. I am tired of seeing a coverage of cheese more akin to the coverage of the hair on my head than that of Tom Selleck’s fulsome hairline. One day soon I hope I find a parma with cheese covering a large swathe of the parma. Side Dishes: After 3 weeks of what can best be described as a flip of the coin when it came to which of the two side dishes would be good and which would be bad, finally this week’s parma was delivered with both excellent chips and salad. The chips were crispy, well battered and hot and the salad was fresh, tasty and well seasoned. The non-reviewables: Price wise the GCH parma was very well priced at $16. I have to confess that when I was a drinker the Grand Central Hotel Beer Hall was almost a local for me given the amount of time I spent in it however I have only just of late discovered its other bar and the eating area. No matter whether you are looking for a traditional pub vibe or prefer more of a wine bar vibe the Grand Central Hotel has you covered. The Final Word: You are in the Brisbane CBD and you feel like a chicken parmigiana then you should definitely work up to Ann Street and try out the Chicken Parmigiana at the Grand Central Hotel. It is a solid meal, despite the shredding of the ham, that will not break your bank. This entry was posted in Uncategorized and tagged Brisbane, brisbane best, brisbane eats, chicken parmigiana, Grand Central Hotel, Parma. Bookmark the permalink.